services for new and existing residences. Pro-West Contracting offers quality, cost-effective solutions for all types of residential foundation repairs. With decades of general contracting experience, we can modify your house and turn it into your home. We can take your dreams and build them into reality with a fun and exciting “dream-building” experience. Our company specializes in providing quality structural repair and general contracting services for new and existing residences. We have the training, experience and warranted products you need to solve any residential problem. Pro-West Contracting, LLC is dedicated to helping you get the most out of your home. Our experienced professionals have been serving the Denver Metro area for more than 25 years. We offer a multitude of services: from structural foundation repair, to general contracting services such as interior trim and drywall installation — all the way to designing and building your custom dream home. With new construction, we can help you and your family enjoy your home for years to come. We know that your home is your most valuable asset. When you have a structural problem and choose Pro-West Contracting to help you resolve it, we understand that the task of repairing your home is an important responsibility. Over the years, we have worked on virtually every kind of foundation. The structural integrity of every home is dependent on a sound foundation. 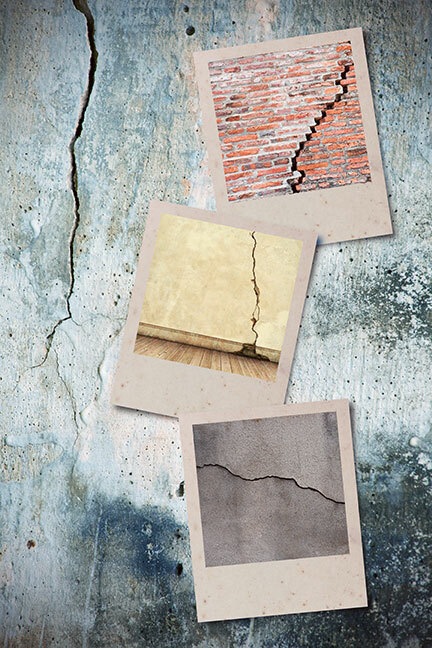 Small cracks in your walls, bricks, or door frames may indicate settling or a shift in your foundation. It's important to identify the source of the issue and stabilize your home’s foundation before the damage spreads beyond repair. Our foundation repair experts are dedicated to maintaining the integrity of your home. Find a crack in your wall? Contact Pro-West Contracting for your free assessment today. Pro-West Contracting has been a BBB accredited business since 2012 and has an overall rating of A.
Piers can stabilize settling foundations by connecting footings and walls to solid, load-bearing soils.